Evolve.Markets is forex broker. Evolve Markets offers the MT4 trading currency platforms. EvolveMarkets offers currency pairs, cryptocurrencies including bitcoin, indices, commodities, cfds, gold and silver for your personal investment and trading options. 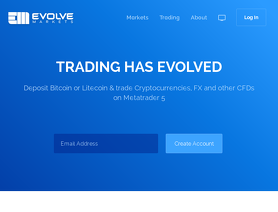 Evolve Markets is crypto-first trading platform that gives you access to leveraged trading on crypto, forex, commodities and indices. Signup is REALLY easy. I'm pretty demanding when it comes to detailed questions and so far support as been very helpful and professional. Execution has exceeded my expectations and i confirm some spreads get to 0 on the pro account. Deposits are put in automatically on bitcoin confirmation, so i really like how I can keep as little possible on deposit and send more when it's needed for a new trade or cover a losing one . Thank you for the feedback, we really appreciate it! Anything you need please let us know, we are always available to help our clients . http://evolve.markets/ is certainly the best forex trading sites I came across. Brilliant support, most importantly they let u trade with Bitcoin! Khalid should learn not to promote brokers in non-commercial areas of the FPA's forums. He also needs to learn not to provide misleading location information. The FPA does not appreciate forums or review spammers. Hello Khalid , We suspect you are overtly spamming to damage our review page. Whatever the motive, our FPA review page is very important to us and traders looking into our trading services. All else aside, we invite you to create an account, trade with us and return here with a real review. No problems so far all good. Finally another broker that focuses on crypto currencies. They seem surprisingly serious and so far I had no issues with trading. Withdrawals are manual but fast. New but still good broker so far. Registeration is easy and fast. Great that they focus only cryptocoins. The best bitcoin-accepting platform out there! EvolveMarkets is a relatively new platform, but definitely outperforms the competition (1broker, simplefx, etc.) by letting me use MT4 to trade. They also actually pay out when you try to withdraw unlike some of the similar platforms that accepted bitcoin in the past and closed up shop overnight. HIGHLY recommend! I have been trading with Forex for more than two years as a retail trader. May be this career is short if we compare with other expert traders. In my short experience I have traded with several brokers. Now I am trading with a broker called Evolve Markets which offers bitcoin trading system. I am comfortable trading with them because I am facing no technical errors here. Besides they maintain a high technology and so far if they can maintain the quality their future is undoubtedly bright. Excellent solution for me being in the US with BTC . I'm getting better spreads and execution than with Oanda and on top of that there is no hedge or leverage restriction and deposit/withdrawals are faster with BTC with evolve. In my long career I have changed several brokers due to several problems. But now I think that my best selection was Evolve Market broker. Because bitcoin is more valuable than any other currency that’s why I have more feedback with that. I have also other scalping friendly facilities with the broker and I have been trading here for more than 1 year without facing any problems. Hey, guys, I've tried them all, and this company is fantastic. I have tried every broker that offers services to my country, and out of all of them I will say without a doubt that evolve is the most honest of them all. My comments are based solely on my experiences with them for the last year. They are one of the few Bitcoin brokers who are fast with their deposits and also quick with their execution. Everything with these guys is top notch. They treat their clients great. I had some slippage issues when I first started with them, and they quickly responded and even went as far as to contact the liquidity provider and fix the feed. They then credited me back my full amount that was clipped and put a filter on my feed. I can't tell you any other broker who has ever done that. These guys care about their clients, and their system has been flawless for me since I first started. They have come to long ways, and I will be a customer with them for life. Additionally, their withdraws are straightforward and quick too because were dealing with the most amazing fiat around that is the Bitcoin solution. The best hands down. Also please know I have several broker reviews up and I tell it the way it is. Anyone can contact me in the forums here anytime to verify my stuff. I am the independent solo trader and hate sales guys :) Let's try to keep these guys around. So far so good, we'll see how it goes. Just started using them. I forget how I found them. Was researching alternatives to Oanda, which I've used since 1999 (!). I'm in the northeast USA. Though I think all the reviews except the hilarious one by Kahlid in USA ("really Malaysia!") are all fake spam reviews by evolve.markets, I gotta say, so far so good. I created my account in seconds (including a live MT4 trading account), zapped some bitcoin their way, and within minutes I'd bought dollar/yen. I made twenty bucks quickly and just as a test, I put in a withdrawal request for the whole amount (my deposit of like $26 worth of bitcoin plus the $20 worth of bitcoin that I'd profited) and lo-and-behold, the bitcoin reached my Jaxx wallet within a very short time! Maybe around 20 minutes or so? I don't remember, but it was fast. So ... they seem ok so far. I have no idea if they're crooks & will end up stealing my money or fu*king me over in other ways. We'll see. I just got sick of using a USA-based broker (Oanda) with their 50:1 leverage and $20 withdrawal fees etc. I created an account just to tell how pleased I am with Evolve markets. Weekend trading and all is super nice. I haven't had one problem with them. It's amizing how good a broker can be without beeing regulated. Evolve Markets are highly recommended. They have very competitive spreads and you can trade on MT4. No issues experienced so far. this morning, I woke up and checked my trades on the mt4 platform. The price of BTCUSD went from 8072.794 to 471.116. It whipped out all my demo account. By chance, it was only a demo account! This morning, the graph shows no drop as if nothing had happened. ;( So I do not thrust them anymore. FPA, please remove my previous review. There was a misunderstanding. It has been corrected. Thanks. Nov 23, 2017 - 1 Star Evolve Markets are crooks. Very bad brokerage that stop raids their own clients. I woke up this morning on Thanksgiving day only to see my account got wiped out and owing thousands due to a few thousand pip drop on BTCUSD. I've checked other brokerages including Trading View, SimpleFX, GDAX, Fx Choice, etc. and none of them had this MASSIVE price manipulated drop as we see with Evolve Markets. [See attached file]. All these positive reviews I see on Evolve Markets are now void. Reviews are updated, not removed. Whether or not a company resolves issues is very important information for potential clients. Hadn’t had any issues with this broker until I woke up to a large BTC/USD drop which stopped out all my trades on Thanksgiving because their liquidity provider blew up. Instead of fixing my issues they just deleted my account even though I had also had a lot of trades going in my favour on BTC/USD. Another minor issue this broker is a wide spread on LTC/BTC which didn’t really bother me since spreads on everything else are good. I would have recommended this broker since it was very good for a while but what happened last month changed my mind. Luckily I only lost .1 btc though. We had an issue last Thanksgiving where a false price stopped some clients out. As soon as this happened, we restored every single account to its positions, balance, and equity before the incorrect price. We also implemented extra price filtering to not allow such an off market price to occur in the future. At no point have we ever deleted a users account or taken their money. I would like to update my review. I have since contacted their support and they reset my account and positions after the bitcoin fiasco. I made my first withdraw and it was process within 2 hours. Nov 23, 2017 - 1 Star I decided to sign up with this broker because they accept bitcoin and US clients. However, only after trading with them for 2 days, it seems like they manipulated the price of BTCUSD. At the current time of writing BTCUSD is valued at 8181.2 in a matter of minutes the price on the platform plummeted to 469.578. This plummet caused the equity in my account to be devalued, and thus my positions were stopped out as a result of the price manipulation. I haven't ever been interested in writing a review about a Broker because generally over time the Brokers I've traded with in the past have shown their shady ways and I'm uninterested in writing negative things. For the record I've been trading with this Broker since May of 2017 because I saw that they offer BTC denominated accounts & I wanted to earn BTC instead of USD/EUR like my most brokers. My experience with them has been fantastic. Withdrawals happen in less than 24 hours and go right to my BTC wallet with no issues or problems. They always have good spreads and their liquidity providers usually have amazing uptime --- until I experienced my first ever blackout/outage with this broker today. Their servers on the platform went down for nearly 45 minutes during London trading (the busiest time of the day) and I was unable to manage any of my open trades. The outage in fact did cause my trades to be closed for a loss due to price swiftly moving out of my direction temporarily. I sent an email to the support department and within 20 minutes I received email back apologizing for the inconvenience and mentioning that they wanted to know the trade ID of the trades that were affected by the outage. The loss was very little, but Evolve Markets gave me 1.5x the loss as a sign of good faith and did it within a matter of 30 minutes from sending my initial email. Many of you are traders who may have been trading for a long time or are just now starting to get into it. When a platform goes down during the busiest time you will be frustrated to see the losses that come from it going down; however, in my past experiences with other Brokers many of them deny any issues in platform and will rarely ever man up to the mistake and better yet resolve it. Not only did this Broker provide me with my losses back, but they even gave me 50% more for my troubles. If you're looking for a broker that has almost instant deposits and withdraws and for a Broker that is willing to do the right thing when something goes wrong then I highly recommend the team over at Evolve.Markets as they will make sure you are happy if there was a mistake on their part (not on your trading lol). I hope this helps many of you who are possibly interested in Evolve Markets but have not heard much about them. I am extremely happy with how they have gone extra mile to ensure their Traders have a safe, secure, and up-to-date platform for trading and making money. Attention SCAM! Account number 16148. Put on a withdrawal and 7 days do not withdraw. Answered so on the next day: "most withdrawals are sent within 24 hours however your account has been flagged by the compliance department for further review. We apologize for the inconvenience, we will let you know as soon as the investment is completed." They're not answering anymore. I will create a topic in the Scam alerts, let's see what to answer. Follow the news. Finally!! Been waiting for something like this for a looooong time. I get withdrawals processed in a few hrs, not like SFX where you get endless excuses from their 'support' instead of bitcoin. And SURPRISINGLY withdrawals are free.... pretty much everyone else wants to lock you in with withdrawal fees.... so you dont want to withdraw. If they keep the service this good I will stay with them forever. Will update if this changes. I am really impressed. The withdrawals and deposit are the fastest i have ever seen and the customer support is great. I get an email back within a few hours. This is the best forex exchange for trading with BTC. This firm has been around for a while. I've received withdrawals any from 1 hour but the lastest would be 48 hours process time. If you are a serious trader who looking for long term growth, evolvemarkets may be what you've been looking for. Nov 18, 2017 - 5 Stars High Recommend EvolveMarkets! If you are a serious trader, they can be trusted. I have been using EvolveMarkets since May of 2018. All I can say is I have not had a single incident or problem with them. Excellent broker! There have been no problems from that. You are my most recommended broker because payment and withdrawal are quick anyway! Feb 26, 2019 - 3 Stars The withdrawal is smooth. There is no problem for MT 5 so far. However, there is a problem with MT4. The spread is very uneven. There is a time when it takes about one minute to make a contract until about 10 minutes every hour. It takes about three minutes to make a contract when it is severe. It usually fits in around 10 minutes per hour and starts newly in the next hour. Reply by EvolveMarkets submitted Mar 5, 2019 Thank you for review and for the feedback, we really appreciate it. We made improvements to our feed and we expect this behavior will not happen again.